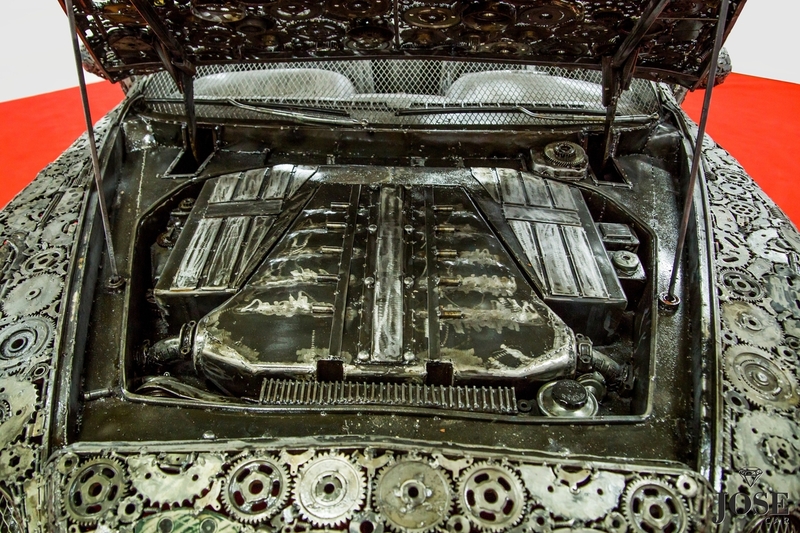 These hauntingly beautiful art pieces bring scrap cars back to life. At The Clunker Junker we buy cars all across the USA, from Atlanta. GA to Denver, CO. We Americans often think up weird and wonderful ways to re-purpose auto parts, but over in Poland Mariusz Olejnik has taken things to a whole new level. 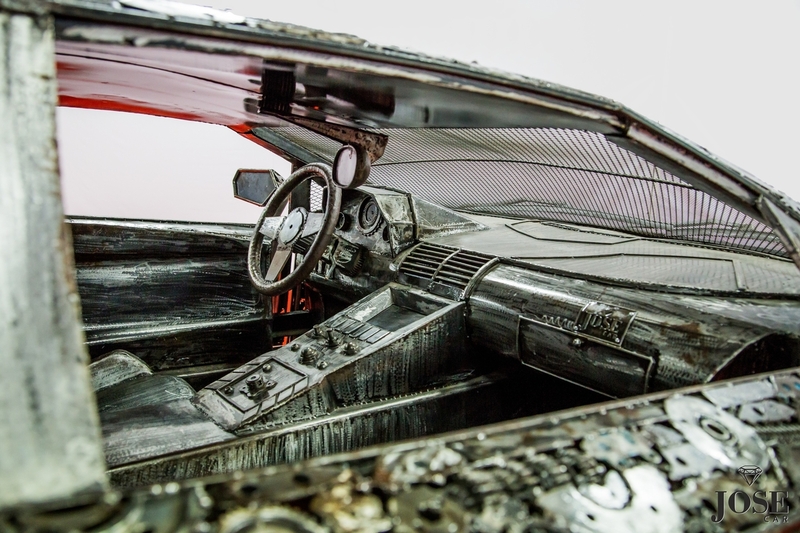 The artist has upcycled old car components, turning scraps of shiny metal into awesome art compositions. The exhibition needs to be seen to be believed: metal figures made entirely from reconstructed cars in a massive warehouse space. 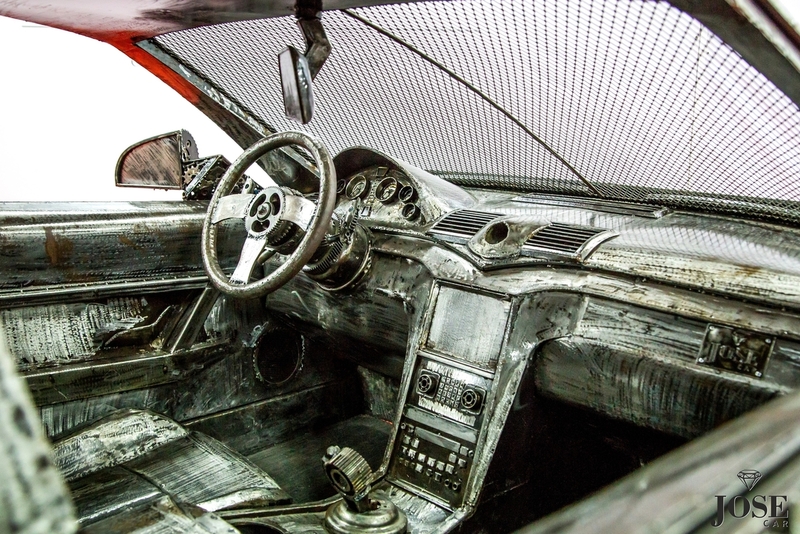 Bumpers, brakes wheels — all of these auto parts have been transformed into steel statues. Some are stunning, and others are slightly scary, but all are must-see pieces of modern art. Olejnik’s metal statues are housed in the Gallery of Steel Figures in Pruszków, a Polish city with a burgeoning arts scene. 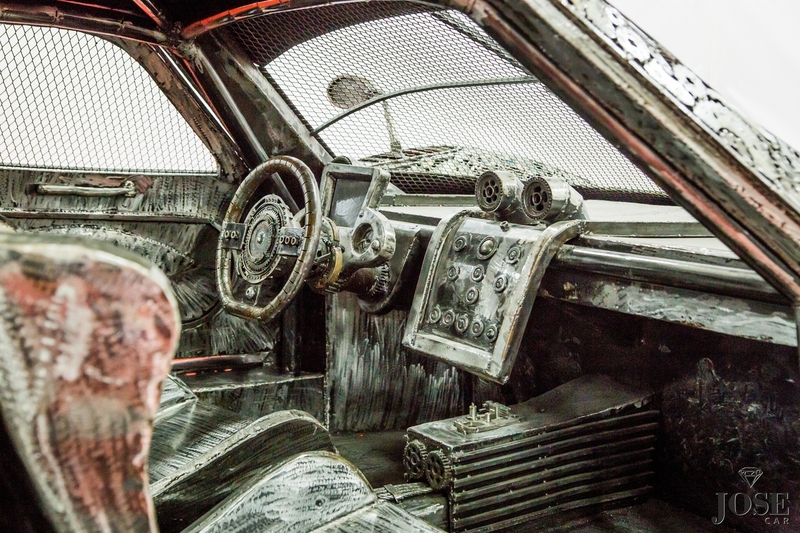 Inside the museum, there are dozens of sculptures created from old vehicles. 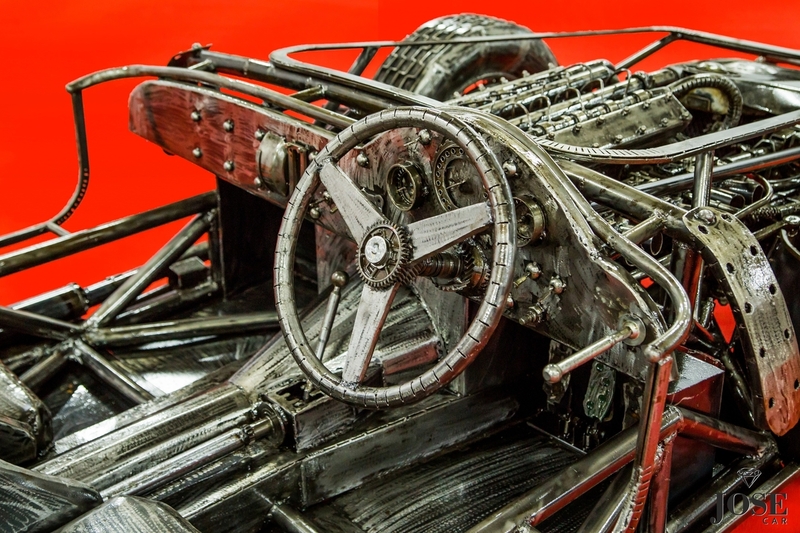 The centerpiece of the exhibition is a series of vintage cars — there’s a Mercedes-Benz 300 SL, a Maserati GranTurismo, a Lamborghini Aventador and a Bugatti Veyron — built to scale with scrap metal. 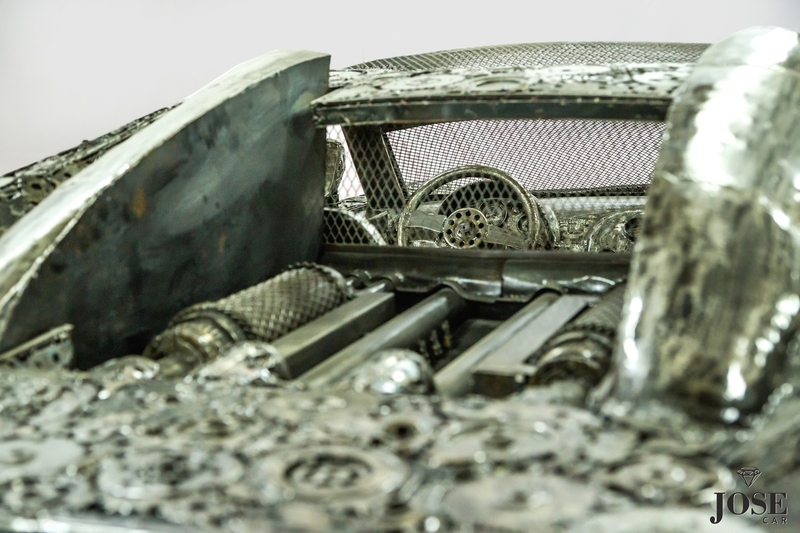 Look closely and you’ll see incredible detail: the hood of the Lamborghini consists of hundreds of steel screws, bolts, discs, coils and springs. The doors are completely functional, too. Open one up and gawp at the gleaming metal interior. 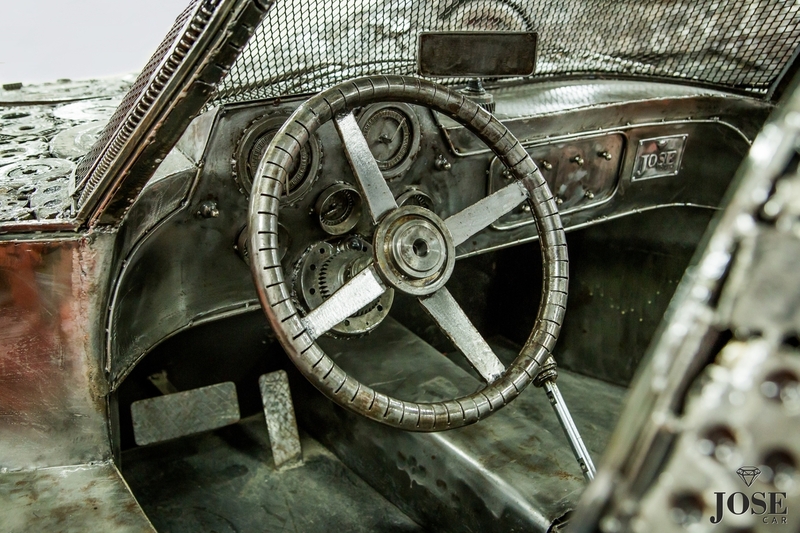 It has steel seats, a steering wheel and even a dashboard. The Bugatti has an exposed engine, real-size seats and a gear lever. These supercars prove it’s possible to get creative with just the most basic of materials. Here, conical washers and spacers help to replicate gearboxes and transmissions and engines. The finished result is an unusual tourist attraction for car buffs everywhere. Aside from the cars, there is also a collection of motorbikes, again made from reconstituted steel. Just like all the other exhibits, these bikes are incredibly complex, made up of hundreds — perhaps thousands — of tiny parts. Elsewhere at the Gallery of Steel Figures, you’ll find sculptures inspired by fairy tales, science fiction movies and celebrities. Check out the life-size Incredible Hulk, complete with rippling muscles and ripped shorts. From head to (extra large) toes, the entire sculpture is created from metal. A burnished Gollum from the “Lord of the Rings” movie franchise sits nearby; his saucer eyes and razor teeth have been hand-carved from steel. A massive lion greets guests, too. Its mane, whiskers and paws are made entirely from metal washers. This is a great place to take a selfie! Olejnik was inspired by London’s Madame Tussauds, and his sculptures are just as lifelike. He has replaced wax with steel, but the figures have the same intricate detail. Every wisp of hair, and every thread of clothing, has been immortalized. The Gallery of Steel Figures points out that scrap metal is usually seen as waste, but it can be turned into something else entirely. Olejnik has certainly achieved this feat, creating a local landmark that both children and adults will enjoy. The Gallery of Steel Figures is located at Przejazdowa 17 05-800, Pruszkow, Poland. It is open Monday through Friday from 8 a.m. to 6 p.m., Saturday from 8 a.m. to 7 p.m. and Sunday from 10 a.m. to 7 p.m. Olejink plans to display five new sculptures at the museum every quarter. Up to $15,000+ for newer running vehicles! How much is my junk or broken car worth? 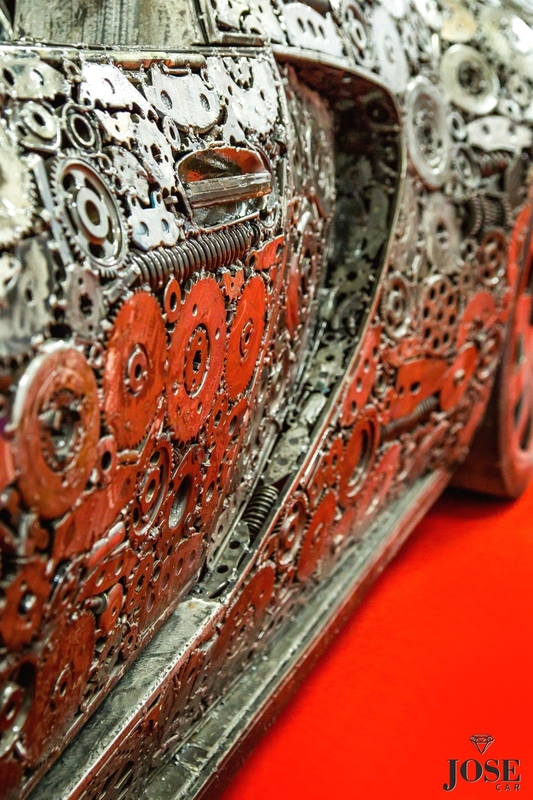 Seven Insanely Clever and Beautiful Uses for Recycled Junk Car Parts!